A long time ago, I bought some chain tassels from Fire Mountain Gems, thinking that they would be the perfect foundation to create a cascade of pearls. 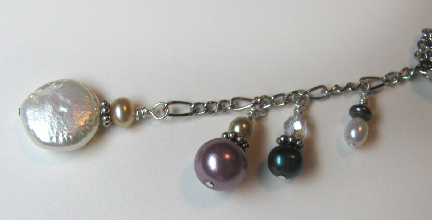 I mixed the pearls with some glass beads, both round and faceted, going for a soft beach-glass look. Vary the colors as you please to create your own cascade of color and movement! 1. 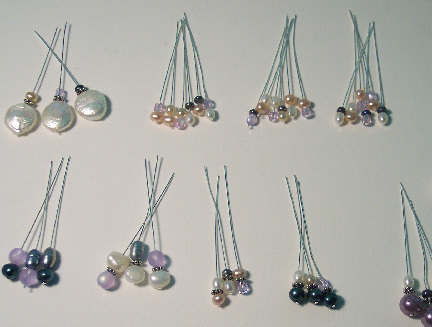 Divide up your beads among the 48 head pins (16 for each tassel). Strive to make some of your clusters small, some medium, and a few large. Make sure that the 3 largest round pearls and the 3 coin pearls end up with one on each tassel. 2. Creating wrapped loops for security, attach 5 head pins to the longest chain strand of each tassel, spacing them evenly and graduating them largest to smallest from the bottom to the top of the chain. 3. Attach 3 or 4 head pins to the 2 medium-length chain strands of each tassel. Attach 2 head pins to the 2 shortest chain strands of each tassel. 4. Attach a beaded tassel directly to the 2 outer loops of the garland link. Attach the middle beaded tassel with a jump ring. 5. Attach the remaining 3 head pins to jump rings, and attach one jump ring to each loop directly above the beaded tassels. 6. Slide a bail through the top loop of the garland link and a chain through the bail. I love this tutorial . 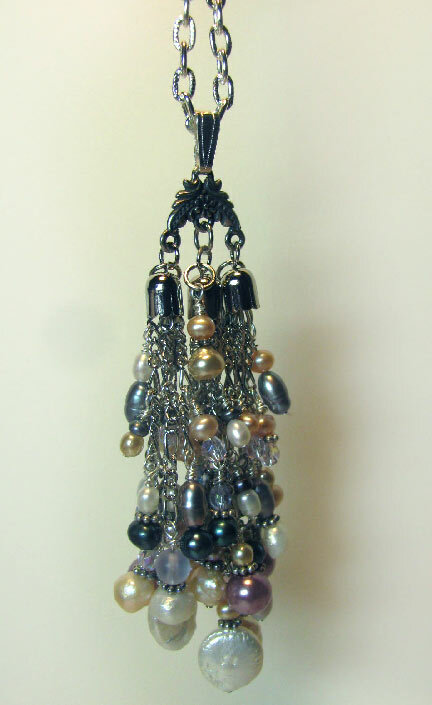 Wish I had known how to create the lovely cascade you have shown when I made my necklace "Deep Sea Treasures"............. for this is the look I wanted for the tassel. Lovely!!! Thank you for the directions. This is an awesome piece and a great tutorial! If you don't mind, I'm going to provide a link to your tutorial in my Pearls Blog Hop that's happening this Sunday the 15th. Shel, that would be awesome :-) Thanks in advance for including me.